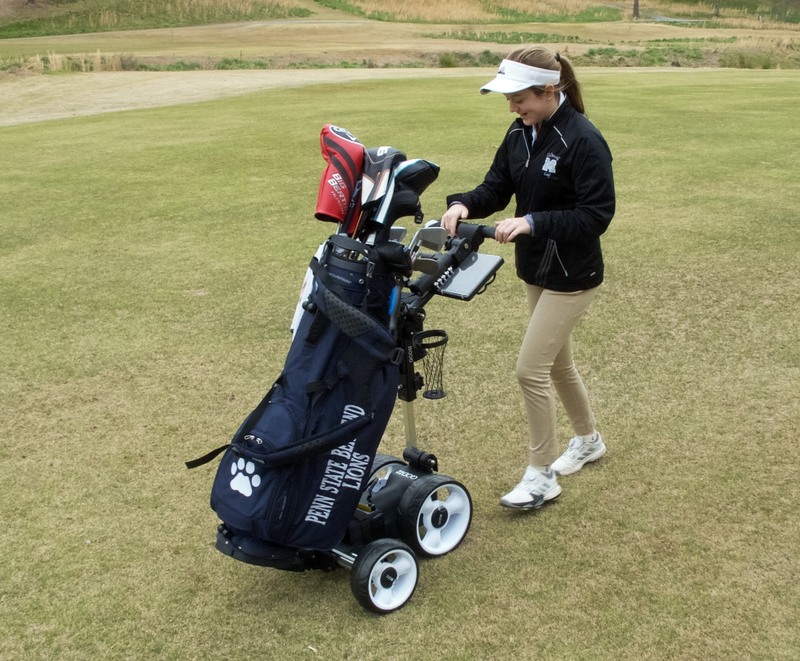 I coach the Penn-State Behrend men’s and women’s golf teams, and one of the first things I did as the head coach was to buy push carts for the top five players. Push carts, the science overwhelmingly shows, increase player performance and have short- and long-term health benefits. Pushing a three- or four-wheeled cart around a course – even with the added weight of the cart itself – is both easier and healthier than carrying a bag. After protests about how it’s not “manly,” my team has grown to appreciate and welcome the carts, to the point where they now hold onto them and I find myself loaning some of my personal carts to my sixth or seventh players. An electric golf cart (you can’t really call them “push” carts anymore, and I’m obviously not talking about the kind with steering wheels) takes the benefits – and let’s be honest, the costs – of a push cart and ratchets them up a few notches. Hills cease to become a concern, except in deciding how they will affect your club selection. 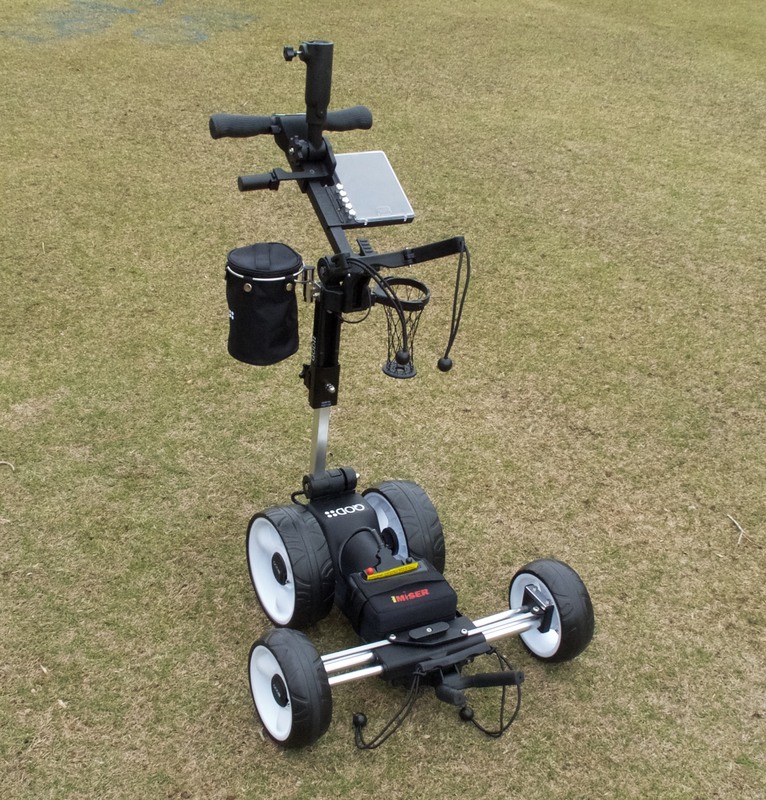 With an electric cart, you can enjoy long walks with your putter… and nothing else. With the QOD’s timed stop, you can grab your driver, putter, and send the cart out to the next fairway, freeing you from having to worry about where to park the cart. It’s almost as good as having a caddie. In other words, if you’re an avid golfer who enjoys walking, then you’re in the target market for a QOD golf cart, and this review should interest you. Henry Ford would be proud of the QOD, as it comes in a multitude of colors so long as it’s black. The black and white styling is simple, but it also fits in anywhere and matches just about anything. The QOD is a four-wheeled cart that, as you’ve seen above, folds up incredibly small. It’s not all that large when it’s unfolded, either, which is admittedly a tradeoff that I’ll discuss later. Unlike most four-wheeled carts, the front tires are wider than the back tires. The QOD is made of mostly aircraft grade aluminum, with some high-density plastic parts here and there and some steel nuts and bolts. There are a few silver bits, an LED “dashboard” between the two rubberized handles, and a variety of places for some of the accessories: a post for the phone holder, a scorecard holder with a clear plastic lid, the umbrella holder, a storage bag with a clip, a small netted drink holder, and a bit more. The battery nestles into a small area at the base of the QOD, and attaches to a short power cord. The controls on the dash have an LED display, three LED lights, and seven buttons: power, stop/start, speed up, speed down, and three pre-set timers (10, 20, and 30 seconds). A USB port is provided to keep your phone charged all day. 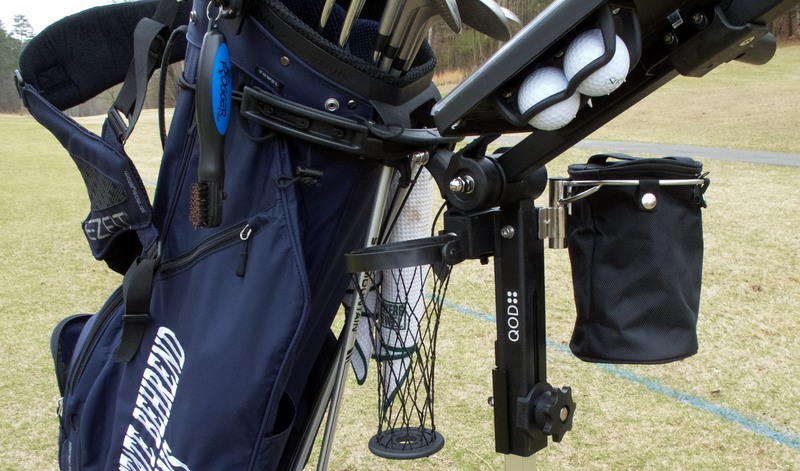 Your golf bag sits on a forked base and inside a U-shaped piece at the top, and is secured to the QOD with two bungees with plastic balls on the end to provide the locking mechanism. Though I knew the QOD cart was small, I was shocked the first time I pulled it out of the box. Measurements are one thing, but until you see the cart in person, you may not truly understand how small the cart appears. If you’ve ever looked away from buying an electric cart because the size would make storing and transporting the cart a pain, look again at the QOD. This cart is smaller than some non-motorized push carts I’ve seen! Being a full red-blooded American male, I took the QOD out of the box and attempted to set it up without looking at the directions. To QOD’s credit, I succeeded. Unfolding and then folding the QOD cart is a simple process: you flip two levers, twist two things, and pull two or three times. Folding the cart after use is just as simple. It’s exactly as easy as it looks in the videos. Of course, since I’m not the CEO of QOD Golf USA, it takes me a few seconds longer. Once you pop in the battery, you’ll want to put your bag in. I found that the QOD cart fits bags of various sizes pretty well. Because there’s no center bar to push into the bottom like on many three-wheeled carts, even a staff bag fits the QOD cart well. I’ve used the QOD for everything from a 3-pound carry bag to a full-size staff bag, and all fit fine. The bungee cord straps each have a ball on the end and are easy on, easy off. The only small complaint may be that the bottom support is somewhat small, but properly strapped in I never had a bag slide around or move. 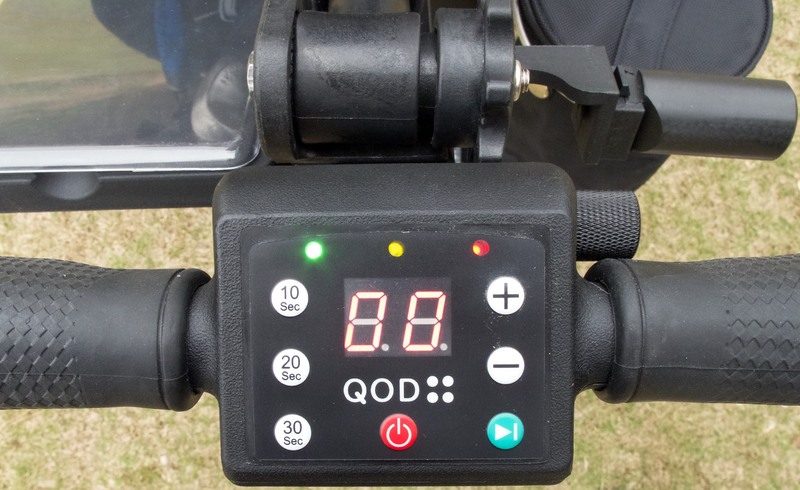 The QOD cart has two ways of setting and controlling the speed: a digital 0-9 speed setting, controlled by the buttons on the handlebar, and an analog potentiometer wheel or knob that can set the speed to whatever finely tuned speed you prefer. The potentiometer knob is just beneath/behind the handles on the right-hand side, very near to the +/- buttons. I don’t love having two settings so close to one another, particularly since changing one setting over-rides the other. Particularly early in my testing, I’d set the digital readout to “6” and then, at some point, accidentally bump the potentiometer knob. The cart would slow down or speed up, and it’d take me ahwile to figure out that I must have bumped the knob. Though I still don’t particularly like the idea of having two inputs for the same thing, I do understand that some customers will prefer the digital setting, while others will prefer the analog setting. Over time, I began to gravitate toward using the potentiometer more than the digital setting, as it’s just a bit easier to twist a knob slightly than to try to hit a button while walking behind a cart that may be bouncing with the humps and hollows of the rough or fairway. Anyway, the speed cart goes from a glacial “01” (or slower if you use the potentiometer!) to a very, very zippy 09. I walk pretty quickly (about 3 MPH), and a setting of “06” felt pretty good. Up hills, I’d bump it to 07 or 08, and downhills I’d sometimes adjust it downward slightly. When I became comfortable using the potentiometer only, I imagine my speeds were still around the 06 level. In other words, the cart goes plenty fast enough. I don’t imagine anyone using 09 on flat ground. Everyone who has played more than a few rounds with a push cart has experienced the “yard sale” experience – your cart tips over on a slight side-slope and your clubs, your towels, balls, your cell phone… everything you had gets tossed about and scattered in a small area of the golf course. The QOD is a small cart, and as such, it’s not the most stable cart out there. Fully expanded, the back wheels are 13.5″ wide, the front wheels are 25″, and front-to-back measures 25.5″. (The height not including the umbrella holder is 42″.) That’s a relatively small footprint that makes for easy handling (see below), but isn’t the most stable platform like, say, a ClicGear 3.5+ or a Sun Mountain Micro Cart. But all that really means, I’ve found, is that so long as you’re not the second coming of Evil Knievel, your cart is plenty stable. Even steep up- and down-hill climbs were handled relatively easily, and moderate side-slopes were no problem at all. In short, if I felt comfortable walking on a slope, I felt comfortable taking the QOD on that slope. 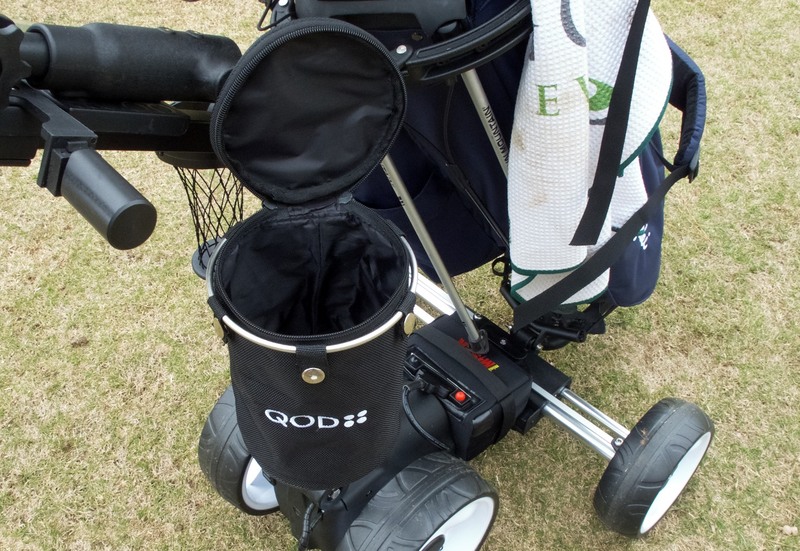 The battery and motor form the bulk of the QOD’s 31 pounds (26 for the cart, 5 for the battery), which lowers the cart’s center of gravity (CoG in a golf cart review! ), adding to the stability. Most bags have ball pockets, water bottle holders, etc. low on the bag, further keeping the CoG low, and increasing stability. The long story short is this: though the QOD has buttons that will send the cart ahead alone for up to 30 seconds, you’ve just gotta be smart about it. On flat ground, I’d just walk within arm’s reach of the cart as it rolled along. On bumpier ground, I’d keep a hand near one of the comfortable handles, mostly to adjust steering if one or two wheels hit a bump and slightly turned the cart a bit. On really bumpy ground, I would rest a hand or two on the handles to help keep the cart tracking straight. All in all, despite the relatively small footprint, the combination of the low center of gravity, the slight suspension system on the front two wheels, and the ease of walking with it at whatever speed you like make the stability a non-issue. The QOD is not intended to be a cart that you send off without regard to what lay ahead, confident that it will not tip over, but with a little bit of common sense you’ll never actually worry about the cart’s stability, and you’ll never find yourself having a yard sale in a bunker beside the 14th green. Once I got beyond what I initially considered a user experience bugaboo with the two controls for the same feature (speed control), I found the QOD to be a joy to use. It “gets out of the way” and has intuitive, clear controls. The controls include + and – buttons to control the “digital” speed, a potentiometer knob for the analog speed control. A power button turns the cart on or off, and a green button starts or stops the cart. On the left-hand side, 10, 20, and 30-second buttons will stop the cart after driving for 10, 20, or – you guessed it – 30 seconds. An LED display with two places serves as either a speedometer or a timer countdown. At the top, a red, yellow, and green LED provide information about the battery capacity. Stopping and starting the cart is easy: you hit the green stop/start button. You can also adjust the speed, and pushing + or – or adjusting the potentiometer sets the cart in motion. It all works exactly as you’d expect. One of the things I’ve never liked about these carts is that the 10/20/30 second buttons offer relatively little feedback. Every time I’d push, say, the 20 second button to send my cart away… I’d find myself wondering after about 15 seconds if I’d actually pushed the button. Sure, the LED display counts down from 20 (or 30, or 10), but you can’t see that once the cart has begun traveling away from you. I’d love it if the cart would beep or do something to let me know that it registered the input. Imagine thinking you’d hit the 10-second button to send your cart to the next tee, only to look up 15 seconds later to see your QOD heading toward a pond. This lack of beeping was present on the two previous electric carts I reviewed, too, so it’s not just the QOD. It seems to be an industry-wide oversight. Don’t get me wrong… never has the cart not stopped when I’ve pushed one of the timer buttons. And you do get the tactile feel of pushing a button, if you pay attention. This is a relatively small issue, but in a cart which is relatively void of any negative issues at all, this one is noteworthy simply because it’s one of the few (tiny) negatives. The handles are comfortable, rubber, and fit your hands well. They’re wide enough without being cumbersome, and they’re quite easy to use to turn the cart. The QOD excels at handling, in part because the rear wheels are relatively close together. This makes sharp turns easier than in some wider carts – you just push down gently to pop the front wheels off the ground, push or pull the handle slightly to turn, and set the cart’s front wheels back down. It’s very easy. Similarly, hopping curbs or rope lines or rocks is similarly easy. 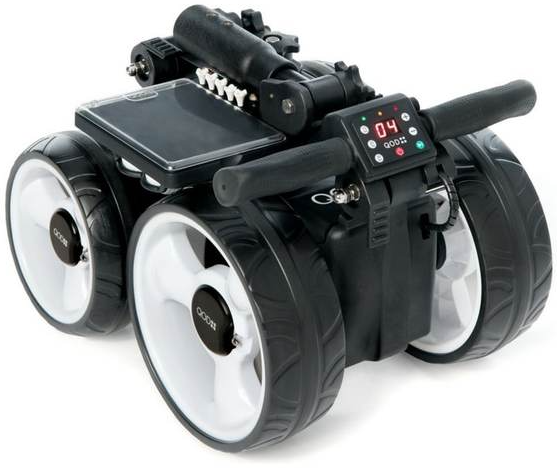 The QOD’s relatively small footprint makes it easy to lift up the front or back wheels. Unique to the QOD, the cart is always in what QOD calls “free wheel mode.” This mode, whether the cart has power or not, allows the cart’s wheels to spin relatively freely. If your QOD is parked but you want to push it a few feet out of the way, just push it a few feet out of the way. There’s no need to turn it on and then turn it off with the buttons. 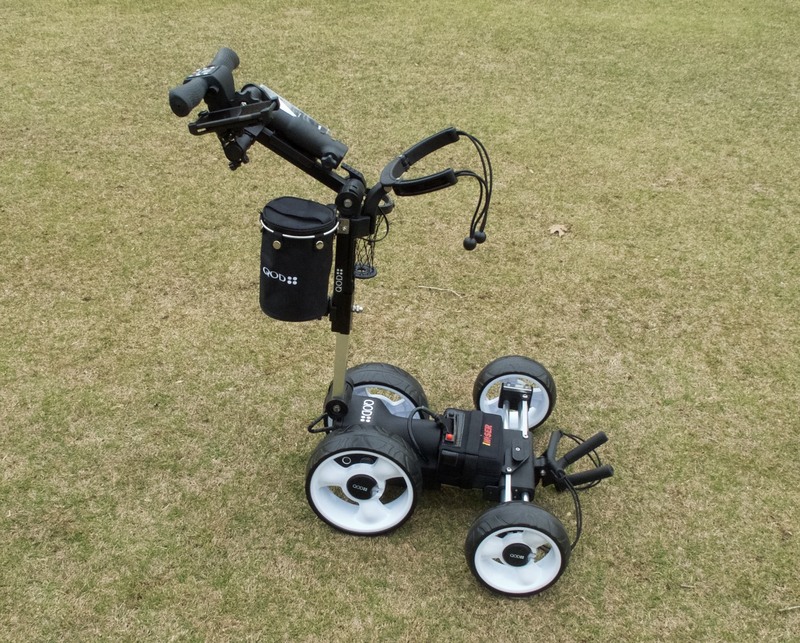 If your battery should somehow die (likely because you forgot to charge it, not because it ran out of power), the cart doesn’t become inoperable – you can push it for the last few holes like you would a non-motorized push cart, albeit a slightly heavier than normal one. In that video my daughter walks along with the cart (speed setting: 05) and then pushes the 10-second button to send the cart ahead and come to a stop on its own. You can hear birds chirping, a little wind, the clubs clattering a bit… and not the motor at all. I’ve even have people play three holes with me before they realize I’ve got an electric cart. It’s so quiet, the Q in QOD might just stand for Quality and Quiet. Battery technology has come a long way. When I reviewed the Sun Mountain and Bag Boy batteries, they were heavy, big and lasted about 20 holes. I had “range anxiety” similar to when I drove my Electric Smart car (which topped out at about 70 miles). I have no such issue with the QOD. The stated battery life is 36 holes, and I can attest to that being a minimum. As a test I walked 18 holes one day, had lunch, and loaned the cart to a friend who walked 27 holes without the yellow LED light even shutting off. QOD says the battery will take eight hours to charge the first time (mine took four), and then up to four hours after each use (mine typically charges in less than 90 minutes after an 18-hole day). The battery lasts for 36 holes, and is guaranteed to last for at least 18 for three years. Replacement batteries are sold at cost. I’ve used the QOD cart in 95° heat, in 40° rain, and everything in between. The battery and the cart just keep on going. With no memory, caring for the battery is easy: store it somewhere cool and dry, and when in doubt, charge it up. That’s all there is to it. The QOD comes with a number of accessories, many of which are included from the outset and permanently affixed to the cart. This is nice because, for example, you can’t forget your drink holder or something. The only accessory that doesn’t really stay attached to the cart is the storage pouch. 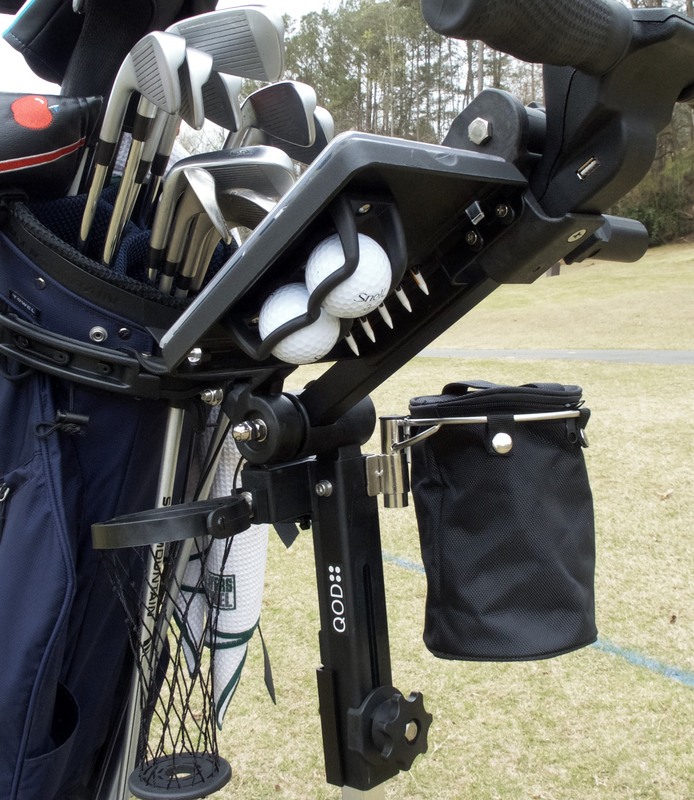 This slides into a metal slot, and offers quite a bit of handy storage for things like your wallet, keys, phone (if you don’t want to use the phone holder), some snacks, your range finder, or other small to medium sized things. It zips up and stays quiet. It detaches in one second by sliding the post out of the slot. Simple. The QOD’s umbrella holder is permanently affixed near the handle. When not in use, you can collapse it downward, making it easier to get at your clubs, and then when the sky turns dark, you can flip it up and extend it in about ten seconds. The thumb screw securely holds your umbrella, and stops it from rattling around like in most push-cart umbrella holders that hold the umbrella with a bit of elastic. 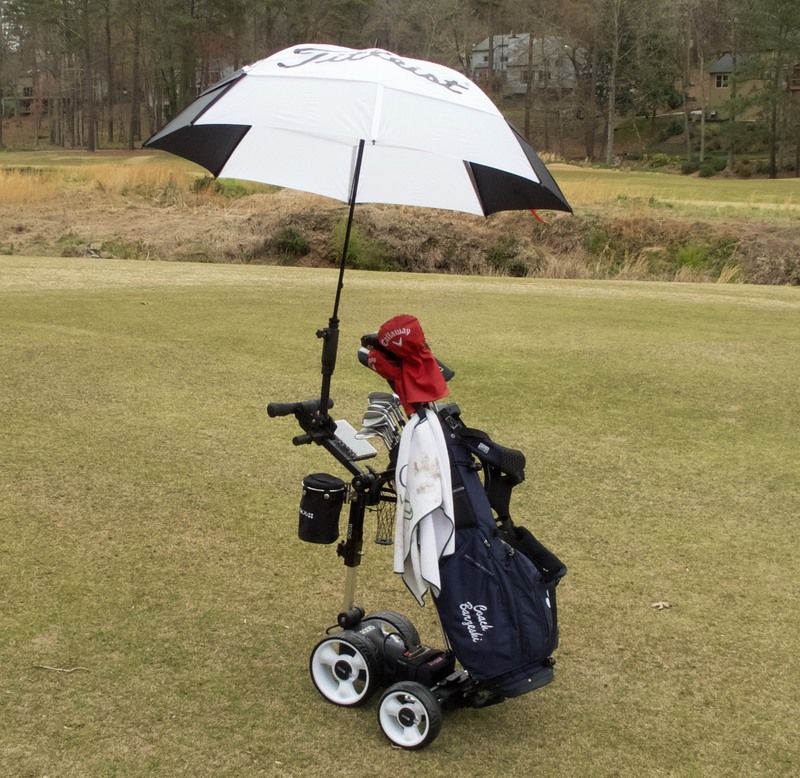 Though the angle is not adjustable, the umbrella is held relatively high and removes the need to duck down to get under or out from the umbrella while you’re playing golf. Left of the umbrella holder, you’ll find a scorecard and tee holder, with a ball holder sleeve beneath. The scorecard holder has a clear plastic cover to keep your scorecard relatively dry in the rain. 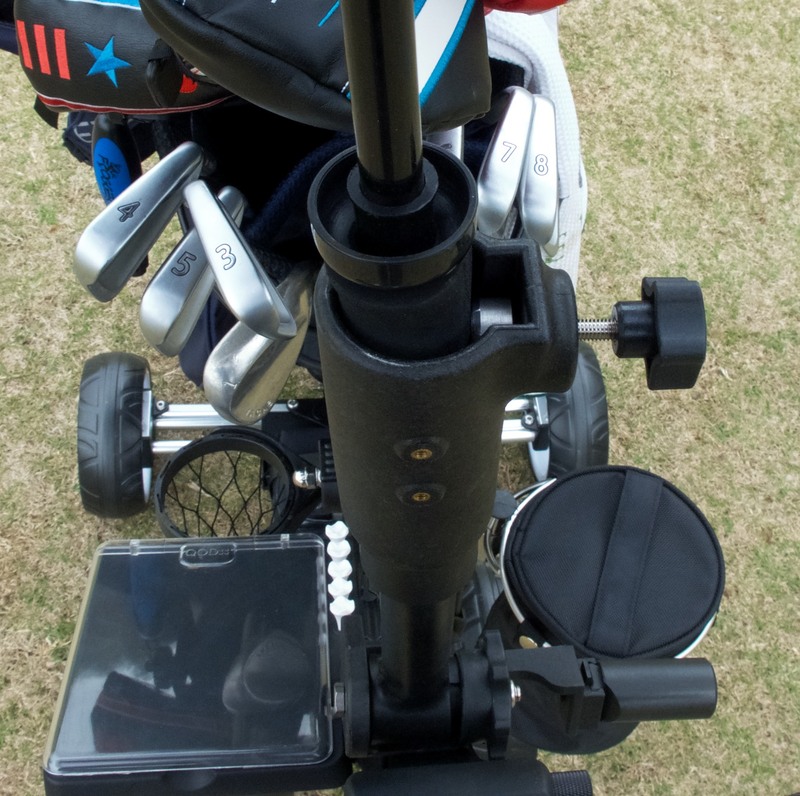 A golf pencil clips beside the tees for easy access, and the balls stored beneath can remain on the cart when folded. Behind the scorecard holder, toward the handles, you’ll find the QOD’s drink holder. It’s also permanently attached (again, so you can’t leave things behind or have things fall off unnoticed), but a bit too small. It fits a can of pop or beer, but if you’re looking to carry around a thicker jug of water, a medium or large Gatorade, or a thermos in the cold weather, you may as well detach the cup holder. If your drink fits, you’ll find that the swiveling, swinging design helps prevent spills or excessive shaking. Switching to the right side, you’ll find a post to which you can attach the QOD smartphone holder. I use a laser range finder (which I keep in the storage pouch), so I often just put my phone in the same storage pouch, but if you’re a GPS app user or simply need to stay in touch with someone, the phone holder will work quite well. It adjusts to securely hold a number of phones, with or without their cases. Perhaps a future version will have a white or reflective cover, as leaving the black screen of your phone facing the sun can lead to overheating. For the later-in-the-day rounds when my phone might drop below 40%, I appreciated the built-in USB port on the handle of the QOD. A 3-foot USB cable was a lifesaver on those occasions: I’d charge my phone while playing golf and just toss the phone in the storage pouch for quick access to check a text from my wife or to check on the PGA Tour leaderboard. 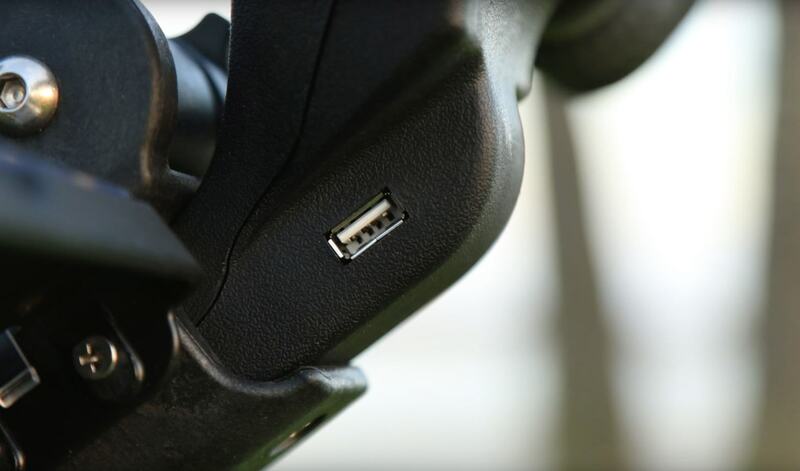 The USB port, of course, can be used to power your GPS device, a small fan, your GoPro or other camera, or any of the many things which charge via USB these days. 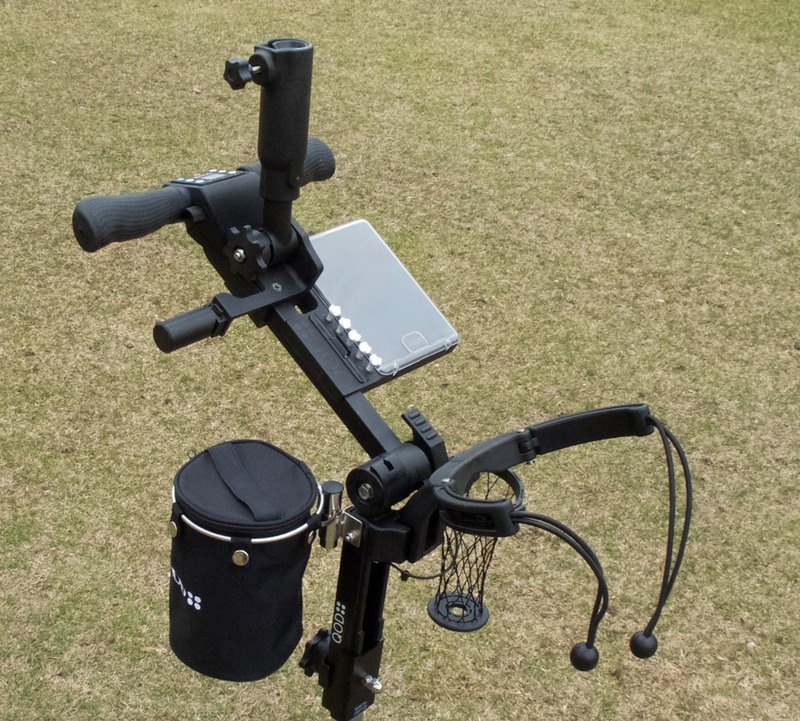 The QOD Cart can be found for a cost of $1249, so this cart is a serious piece of kit for those serious about walking. This is not the cart for a twice-a-year walker (or perhaps even for a twice-a-month walker). This is more for a twice-a-day walker! folds smaller than any electric cart. is made in Australia with care, not in China like most. has a Lithium-ion battery that lasts 36 holes and charges in four hours. 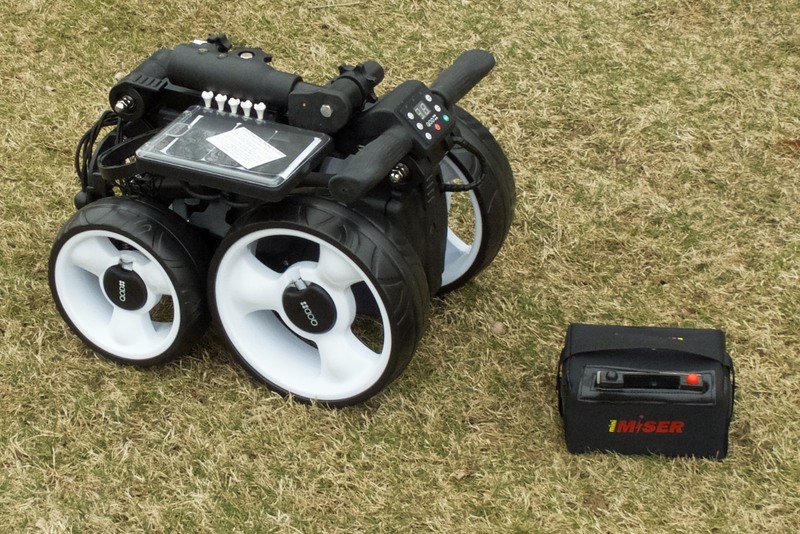 has free-wheel mode, allowing for easy pushing at any time (whether or not the cart is on and/or has power). Accessories include a phone holder, a scorecard/ball holder, a drink holder, a storage pouch, and an integrated umbrella holder. The QOD cart itself weighs 26 pounds and the battery weighs five. The 2018 QOD Electric Golf Caddy is the finest electric cart I’ve ever used. It knows what it wants to be, and does that well. 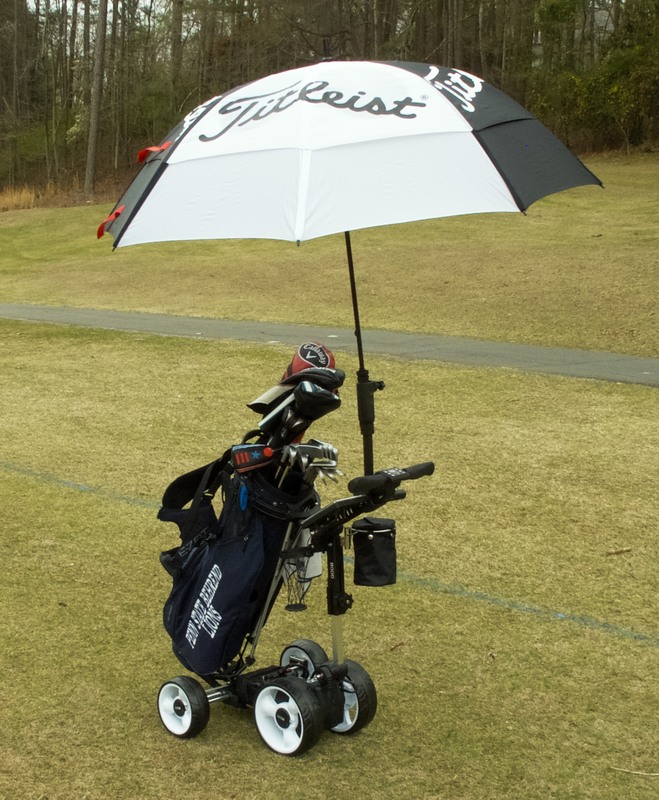 It carries your clubs, freeing you from the hassle of carrying or even pushing your clubs. 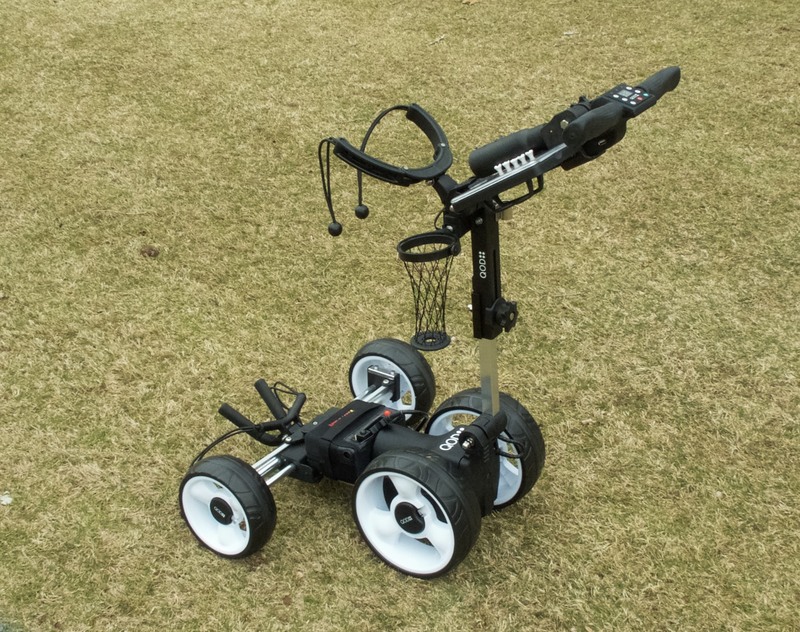 No, it doesn’t have a remote control – you’re supposed to walk near the QOD, not attempt to steer your car around ponds, bunkers, trees, and Mrs. DeSmith’s foursome from 100 yards away. The cart is easy to use. The battery lasts for 36 holes (and then some), and charges from empty in four hours or less. It has a three-year warranty with seven-days-a-week U.S. support. It is stable, quiet, and smooth to operate. 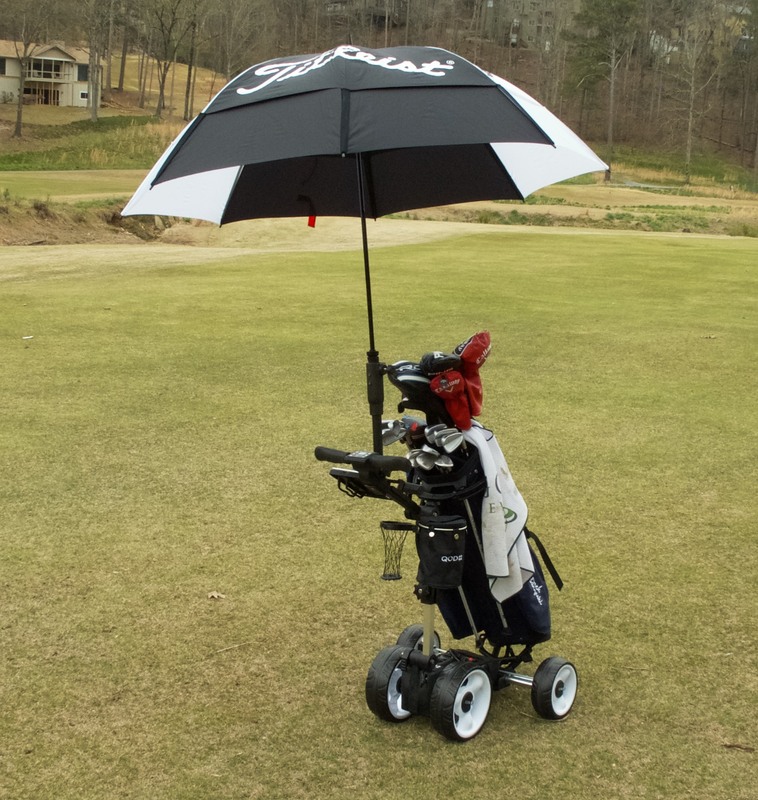 It comes with storage, an umbrella holder, and makes walking while playing 18 holes a joy. And the QOD is freaking TINY, taking up less space than many non-motorized carts. It’s relatively lightweight, making storing the QOD in the trunk of your car (or two or three of them) quite feasible. I love to walk when I play golf, and do so whenever I get the chance. The QOD has taken my joy of walking during a round of golf and taken it to the next level. Yes, it’s about a thousand dollars more than a push cart. But consider what taking a golf cart costs: at $25 a pop, the QOD will have paid for itself after only about 50 rounds of golf, and you’ll be healthier to boot. If you’re in the market – or even think you might be in the market – for an electric golf cart, the QOD should be first on your list. Check it out today. Thats an amazing review . I saw Adams Scotts Parents use this trolley in Switzerland and I wondered where it had come from . Now I realise it is a USA product. How can I get access to the developers I have some suggestions that may be good for them. I am from Ontario, Canada. I live near Toronto, where can I find them to buy. Very cool little electric cart. Thank you for the review! I have been looking to change from a pushcart to an electric cart recently and this might be the one. Quick question. Do you know how stable it will be on a muddy course? With rainy season on us, I want to make sure I can make it through 18 holes. Thanks! I’m seriously considering purchasing an electric push cart and have found there are many brands out there. The QOD seems like a very good product for all the reasons mentioned. However, I have not found any mention of this product anywhere except The Sand Trap. Are sales only through the manufacturer? How many units have been sold in US? Any further information/review would be helpful as there are several other golfing buddies looking into this with me. I will buy one but am used to having a seat on my trundler. Is there any place to attach a seat if not available can I fit one ? My name is Collin Hiss and I am the inventor and owner of the QOD Trolley. It is made in Australia and distributed in the USA via http://www.qodgolfusa.com. Please contact me on +61 299062777 or via email chiss@qodgolf.com if you have any queries. Your review looks quite convincing to me. I am definitely getting myself a QOD Golf Cart as the benefits are way more than the cost. Thank you for reviewing it so amazingly.